More commonly referred to as a nose job, rhinoplasty is a surgical procedure to improve the size, shape, position and/or function of the nose. 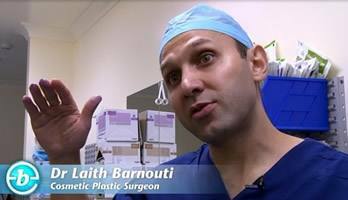 Our plastic surgeon, Doctor Laith Barnouti, works with people who want to change their nose for aesthetic or medical reasons. Rhinoplasty is both a technical and creative plastic surgery procedure. While it can change the external appearance of your nose, it can also alter how you breathe. By choosing a qualified and experienced plastic surgeon like Dr Barnouti, who specialises in the procedure, you’ll know you’re in safe hands and will get a positive outcome. During your first consultation, you’ll have a chance to meet your surgeon, undergo a thorough examination and get his guidance on the best techniques to address your unique needs. This price assumes hospital cover with a private fund and that your rhinoplasty procedure attracts medical item numbers 41671 and 45644. If private health fund cover does not apply in your situation, plan for additional costs of $3,000. We look forward to finding out more about your needs and to helping you with your rhinoplasty procedure. Some patients wish to reduce or increase the size of their nose, change the shape of the tip or the bridge, narrow the span of their nostrils, or change the angle between their nose and upper lip. Others are more focused on improving their ability to breathe. Closed Rhinoplasty is performed from inside the nose producing no visible scars. Open Rhinoplasty involves an 8mm incision at the base of the columella, the flesh which separates the nostrils. This allows the skin on the nose to be lifted so the procedure can be done under the surgeon’s direct vision. During either of these techniques, septoplasty and turbinectomy procedures may also be performed on patients who need to breathe easier through their nose. An enlarged turbinate which can be corrected by turbinectomy. For people who’d like to have a smaller nose, reduction rhinoplasty reduces size or changes shape. This procedure involves cutting away excessive cartilage and bone then letting the natural skin envelope shrink down to the smaller framework. Dr. Barnouti’s main focus when performing this procedure is to create a smaller, natural looking nose while maintaining good breathing capacity. For people who’d like to have a bigger nose, the augmentation technique uses either natural tissue or nasal implants to create a nose that matches your face and any racial characteristics. The shape and size of your nose is produced by its underlying cartilage and bony architecture. Therefore, smaller noses can only be enlarged by the precise placement of grafts from your own tissue or implant materials such as silicone, gortex or medpore. Augmentation rhinoplasty is most commonly requested by our Asian clients and our focus is on creating a natural-looking nose. For people who are happy with the size of their noses but not their shape, reshaping can address a wide range of issues and may focus on the shape of the tip, the bridge, or the root of the nose. Depending on the exact issue and shape modification required, reshaping rhinoplasty can be addressed through simple non-invasive techniques. However, a surgical procedure may be required. Also known as Septorhinoplasty with Turbinectomy, this procedure balances the shape of the nose and improves breathing ability. During surgery, care will be made to ensure both the front and side views of your new nose are equally appealing while breathing functionality is improved. Dr Barnouti will consider your facial proportions, skin thickness, cartilaginous rigidity and bony formations. While working on the appearance of your nose, the nasal septum and turbinates may also need attention to improve breathing. Dr Barnouti will advise you on the best approach for your individual needs during your initial consultation. During your first consultation at one of our three Sydney plastic surgery clinics, your full medical history will be taken, Dr Barnouti will discuss your goals and wishes and then thoroughly examine your nose. Based on this information he’ll determine whether you’re suitable for a soft treatment or whether you require a surgical solution. In many cases, a soft treatment, such as filler to augment the size of your nose, can be provided on the same day of the consultation. During the consultation, we will use computer analysis to show you the different options and give you a clear idea of what to expect after your procedure. You’ll be able to discuss possible alterations to nasal tip, dorsum, width, bridge, and base size. Changing one of those elements of your nose can have a significant effect on the appearance of the others but we will be able to advise you on the implications and best options to suit your preferences. During surgery, Dr Barnouti will sculpt and reshape the framework of cartilage and bone, either through closed rhinoplasty which leaves no visible scar, or through open rhinoplasty which will leave a small scar at the base of the flesh in between your nostrils. How long does it take to recover from surgery? A splint or cast will be applied immediately after surgery. The area will be sensitive to touch for the first few days with some bruising for seven to ten days following surgery, with bruising usually peaking two to three days after surgery. Cold compresses or ice packs will be applied for the first 24 hours to minimise swelling and bruises and help accelerate the healing process. If there are stitches, they will be removed five to seven days after surgery. After that time most patients do not need further dressings. How soon can I get back to work and regular activities? You will need to rest completely for two days after surgery. You can return to work after the first week provided your job does not involve strenuous activities like lifting heavy objects. Intense physical activity should be avoided for about a month due to the vulnerability of the nose during this time. Septoplasty is a surgical procedure to correct a deviated septum and make breathing easier. Many of our patients suffer from obstructed breathing because their septum, which is the wall between their nasal passages, is displaced to one side or blocks a nasal airway. This issue may have been present since birth or it may be the result of a broken nose or other accident. Septoplasty corrects the problem, either by straightening the septum, or by removing the deviated part of the septum. This opens both airways and ensures you can breathe easily through both nostrils. Turbinates are long, narrow passages inside the nose which help warm and moisten air as it flows in. Turbinates may become enlarged due to chronic sinus inflammation, environmental irritants or allergies. However, if one or more turbinates gets bigger this commonly leads to restricted breathing with symptoms such as snoring, nasal congestion or facial pain. A turbinectomy reduces the size of the turbinate to make breathing easier again and is usually performed at the same time as rhinoplasty to improve and facilitate breathing.